HP LaserJet 2605DN is a very user friendly color printer from HP, designed for home or office, but with a slow printing speed of around 20 seconds for the first page. However, even if the printer's speed is not so good, this model is a very popular one because of its simple design and good quality. The printer has a higher monthly duty cycle than the HP LaserJet 1600, offering the user the possibility to print even more than before. The maximum resolution is 600 by 600 dots per inch with HP ImageRET 2400. The handling capacity is set at a default 250 sheet, but an additional 250 sheet tray can be purchased. This model of HP comes with a single plate, but its successor, HP LaserJet 2605DTN comes with additional paper storage and photo memory card slots. The output is a standard 125 sheets. The two sided printing feature is available thanks to the built-in duplexer. This saves paper, time and costs while providing a better experience for the user, who doesn't have to always take the paper out and put it in again to print the second side. The connection with the computer is assured through an integrated USB 2.0 interface. There's also an option for network connection, through the integrated Ethernet 10Base-T/100Base-TX - RJ-45. The HP Image Resolution Enhancement technology allows the printer to deliver quality color results, at 2400 dots per inch. The processor is a 300 MHz one, ensuring easy movement and the capability of handling a big amount of workload. The processor is faster than HP LaserJet 2600's printer, which only has 264 MHz. However, some user reported some pauses when printing multiple PDF files in a row. The onboard memory is a 64MB, expandable to 320MB through a standard DIMM 100-pin slot. Its predecessor only had 16MB, so the features of this printer are considerably faster than before. 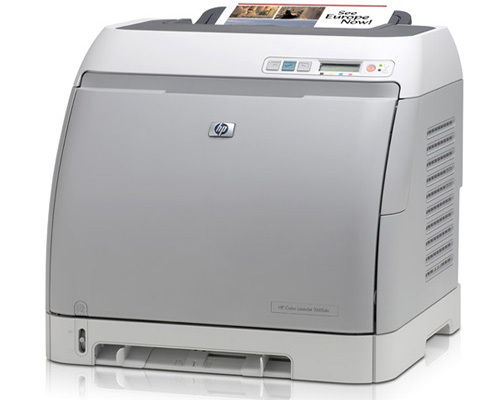 HP LaserJet 2605DN has a monthly duty cycle of 35.000 sheets. It is recommended not to exceed this number to ensure the printer a longer life. The warranty of the product is 1 year, the same as for the whole LaserJet 2600 series. The setup process is very easy to handle by any kind of user because of the included software, such as HP Web Jetadmin device management. The printer and toner are easy manageable through another piece of software, HP SureSupply. 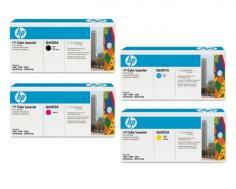 The color of the printed photos or graphics is great, especially if the cartridge used is the one HP recommends. The printer provides sharp and consistent color. There's a wide variety of supported paper handling, including bond paper, brochure paper, color and glossy paper, letterheads, photo, plain and preprinted papers, rough or soft-gloss paper, transparent paper, label, card stock or envelopes. The printing speed is not impressive, with 12 black and white documents per minute and only 10 color papers per minute. When the printer is not warm it takes 20 seconds for the first page to come out, even though the device uses the Instant On Technology. The official value from HP sets the speed at 12 pages per minute, so it's not too far from the real number. Some users suggested the LCD screen could have been a little bit bigger, but that's not a very big issue. Review it: "HP Color LaserJet 2605dn "
HP LaserJet 2605DN's box includes a power cable, a CD with User's Guide and printer software, Network Getting Started Guide, output tray extension, paper tray cover and print cartridges (black, cyan, magenta and yellow). 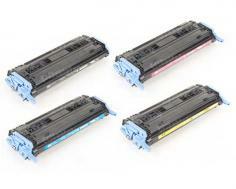 HP recommends using the following cartridges for a better quality of the printed papers: Black: Q6000A; Cyan: Q6001A; Yellow: Q6002A; Magenta: Q6003A. The Black Toner Cartridge yields 2.500 papers at 5% coverage, while the color cartridges yielding 2.000 pages at the same 5% coverage.